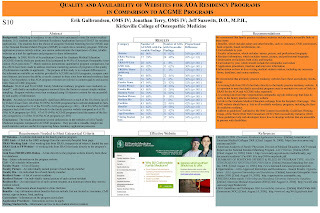 In honor of Erik's birthday tomorrow, I figured it was only right to highlight his first publication, "Quality and Availability of Websites for AOA Residency Programs in Comparison to ACGME Programs." Erik and I presented the poster for this research at the 2008 AOA National Convention in Las Vegas, earning 2nd place in the "Medical Education and Health Policy" category. The work has really taken off from there; the abstract has been published in the January 2009 JAOA, and even more importantly, the ACOFP will be providing a flyer with the research to all AOA residency program directors at a conference next month. Hopefully this will be the start of our team's formal publications to improve osteopathic training.